at the University of Karlsruhe (TH) in the Wintersemester 2003/2004. 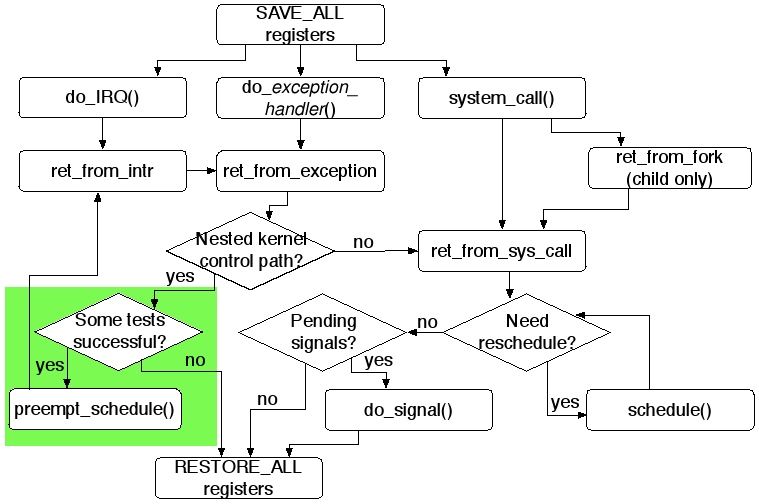 that was merged into the main linux kernel tree as of v2.5.4-pre6 on Feb. 10, 2002. Apart from the original Keynote version I did exports to some other file formats as Keynote is not really available for many platforms (i.e. only for Mac OS X). Unfortunately all these exports suffer from various losses, therefore I comment on the drawbacks of each exported file. This is a zip file the original version. If you have got Keynote, take this one. This is a PDF export with all background images; it is nice but quite slow and big. 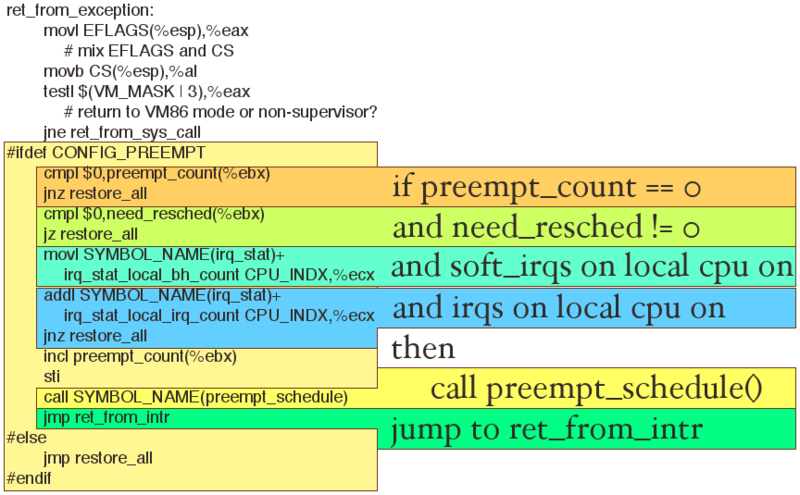 Also the slides are not shown little by little, for most slides this is not a problem but the big graphics about the interrupt handling are perhaps easier to understand if they are not shown at once. This is a PDF export without the background images. It is rather small but less eye candy. All drawbacks mentioned above still apply, of course. This is actually the best version apart from the Keynote file if you have got an interactive Quicktime player (i.e. not mplayer, at least not my version of it). The slides are shown little by little as in the Keynote version. The quality is not really impressive but good enough while the file size is moderate for a video file. This is a Powerpoint export. It is terribly huge and I have never tested it as I haven't got Powerpoint (or even a Computer with a version of Microsoft Windows). Perhaps this is just garbage. the low latency / lock-breaking patches by Ingo Molnar and Andrew Mortan, respectively. 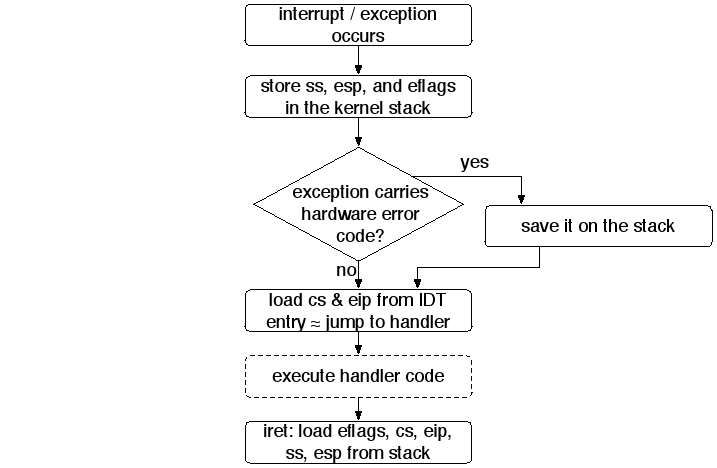 ELJOnline: "Real-Time and Linux, Part 2: the Preemptible Kernel"
ELJOnline: "Real-Time and Linux, Part 1"
Linux Kernel mail: "a joint letter on low latency and Linux,"
Torvalds: "Badly written code will be a problem. The approach that the patches so far have taken is to just add scheduling points all over the map." Torvalds: "I refuse to have a kernel that is bogged down with random crap all over the place. It's wrong. It's distasteful. And it leads to more and more crap over time. That's how you get a BAD operating system." Morton: "[My patch] also reorganises various areas of the kernel which can traverse very long lists when under spinlocks." LinuxDevices.com: "MontaVista unveils fully preemptable Linux kernel prototype"
"Update: Real-time Linux sub-kernels, benchmarks, and . . . contention", Responses and "clarifications" by people of MontaVista, TimeSys, FSMLabs, etc. "A TimeSys perspective on the Linux preemptible kernel"
Although I used Apple's Keynote to create the slides of this presentation please do not understand this as a recommendation for the program. It was a truly pain! I always had to adjust the text size and the line pitch to make the slides pleasant (i.e. to make it visually clear (on the first look) by distance and size which subitems belong to which main item). Another disadvantage was that Keynote runs under Mac OS X as I normally only use Linux. While creating the slides I wanted to have my usual working environment (an old version (version 1.2.8) of the Galeon web browser with a good working session support, GNU Emacs in a non stupidly behaving terminal program for reading the Linux kernel source, xxdiff to compare the changes of the different Kernel preemption and lock-breaking patches) and so I used Keynote running in an instance of Mac On Linux. The problem with this is that Keynote uses direct hardware access to the NVRAM of the graphic card for the presentation mode (if I remember correctly) and so I always had to boot Mac OS X instead of Linux (i.e. not just Mac On Linux) to view the slides not only in the edit mode but in the real presentation mode. Very time consuming and peeving. In fact the disadvantages caused my work on Acclaim as I wanted a presentation program whose slides where easy to create (at least for myself).